Tennessee’s advanced energy sector is a rapidly expanding and lucrative growth sector in Tennessee and a source of high-quality jobs, according to a new report released today, Wednesday, June 17, 2015 by the Tennessee Advanced Energy Business Council (TAEBC) and the Howard H. Baker Jr. Center for Public Policy. The Tennessee Advanced Energy Economic Impact Report is the first document of its kind that defines the scope and scale of Tennessee’s advanced energy sector and quantifies its economic impact. It identifies the number of jobs, contribution to state GDP and state/local taxes and number of companies associated with the state’s advanced energy sector. Advanced energy is a rapidly expanding and lucrative growth sector in Tennessee. Nearly 325,000 jobs are supported by 17,334 firms in the state’s advanced energy sector in 2013. Advanced energy requires skilled labor and thus is a source of high quality jobs in Tennessee. The annual average wage of a worker in advanced energy was $48,764, which is well above the state average. Tennessee manufacturers benefit from a robust advanced energy sector. Especially Tennessee’s automotive manufacturers that are integrating advanced energy technologies into their processes and products as a result of higher fuel economy standards. Advanced energy contributes significantly to our state and local economies. Tennessee’s advanced energy sector contributes $33.4 billion to state gross domestic product, while workers in the advanced energy sector pay more than $820 million in sales tax to state and local governments. Advanced energy represents an opportunity to promote rural economic development. Currently, almost 80 percent of advanced energy activity is centered in just 20 counties in Tennessee. Davidson County leads Tennessee’s advanced energy economy. Rural Tennessee could benefit from further growth in advanced energy activity. Tennessee is not the only state vying for a piece of the advanced energy economy. Highlighting our assets and opportunities will provide Tennessee with a competitive edge in the recruitment and retention of the advanced energy sector. Approximately 11 states including Arkansas, North Carolina, South Carolina and Florida are benchmarking and tracking their advanced energy economies. “Advanced energy” is defined as any technology that makes energy cleaner, safer, more secure and more efficient. Rather than favoring specific technologies, advanced energy is technology neutral. Examples include electric and plug-in hybrid cars, lightweight composites for the automotive industry, natural gas fueled trucks, pollution control equipment, bio energy, high-performance buildings, more efficient industrial processes, power reliability, smart grids, combined heat and power and the latest power generation technologies. The article states that the wind and solar power industries “are growing rapidly and are beginning to move the needle in global energy supplies.” In the past, renewable energy growth has been fueled by deployment subsidies and other support policies such as feed-in tariffs, tax credits and portfolio standards. But with the spark of public interest and investment in renewable energy adoption, the wind and solar industries have taken great leaps. These great leaps have become apparent; from 2008 to 2013, wind turbines almost tripled the amount of electricity generated globally, while solar energy generation grew by more than ten times. Together, wind and solar jumped from providing 1.1 percent of the world’s electricity in 2008 to 3.3 percent in 2013. Tremendous growth, but in order to keep up with (or replace) coal and other fossil fuels, wind and solar will have to continue on this rapid growth pattern. The questions many are asking now are: How much of a role will the renewable energy sector take, and how will it impact the energy system? Many countries (U.S. included) are incorporating renewable energy by using an integrated grid system. This system allows countries or states to share energy depending on the energy needs of the region. An example of an integrated grid is seen in the Great Plains, Midwest, and in Arkansas and Louisiana; this regional energy market is called the Midcontinent Independent System Operator (MISO). So how does the integrated grid system work? One example: in 2014, Iowa generated 28.5 percent of its energy through wind power. This power was used throughout the MISO region and ended up supplying almost 6 percent of MISO’s power demands in 2014. This growth is making a difference in our own backyards. Tennessee’s solar and wind industries are gathering steam, creating new sources of renewable energy and hundreds of jobs all over the state. Read TAEBC’s Roadmap for Tennessee’s Advanced Energy Economy to learn more about the roles that these two industries have in driving the state’s economy. TAEBC’s annual meeting in Nashville on March 26 served as a forum for members to provide feedback on 2015 projects and priorities that foster the growth of Tennessee’s advanced energy jobs, companies and technologies. As well as determine the best role for TAEBC to serve as a champion, facilitator and convener of advanced energy projects and initiatives. Topics covered during the meeting included TAEBC membership, 2015-2016 event calendar, Tennessee Advanced Energy Economic Impact Report release strategy and 2014 successes. Members agreed the greatest value of their TAEBC membership is networking opportunities and increased visibility of the industry. To build on this, TAEBC will launch a 12-month event calendar this summer. It will include another member delegation visit to Washington D.C. to meet with the U.S. Department of Energy to get our members questions answered and problems solved. At the request of our members, TAEBC will submit comments on TVA’s draft Integrated Resource Plan (IRP). Comments will align with our mission and we’ll use the Tennessee Advanced Energy Economic Roadmap as the foundation for our remarks. Members who would like to be involved in commenting on the IRP should contact Allie. 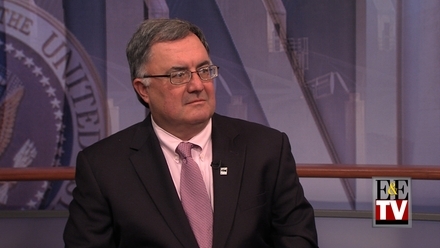 Check out this E&E TV’s OnPoint segment, featuring Bob Martineau, president of the Environmental Council of the States and a commissioner of the Tennessee Department of Environment and Conservation. What jurisdictional challenges exist within states between air agencies and public utility commissions in determining how best to comply with U.S. EPA’s Clean Power Plan? Martineau explains how states are working behind the scenes to figure out next steps on the plan. Click on the photo to be redirected to watch the video on E&E TV’s website. TAEBC member Genera Energy was featured in Biofuels Digest for its single pass forage harvest system, also known as a field chopping system. The system set new records this year for switchgrass harvesting efficiency. With this harvest, Genera continues to optimize its efficient year-round, just-in-time biomass harvesting and delivery systems.